The Series 5800 Electrically Actuated Control Valve is reliable, maintenance-free, and cost effective. Replacing a plug valve, gate valve, or ball valve is easy with the Series 5800 because it has the same face-to-face dimensions. There are no seats to grind, no stuffing box to repack, and no packing gland to adjust, ever. The rugged, self-cleaning elastomer sleeve isolates all mechanical parts of the mechanism, so the break away torque remains constant. Red Valve Series 5800 control valve closes the sleeve on centerline and can be actuated with an AUMA, Rotork or other standard motor electric operators . Declutch and override components are furnished as standard. Operators can be furnished as an integral part of the electric operator or with a remote station. Optional features include: heaters, thermostats, explosive-proof construction, position indicators, indication lights, and proportioning control from a 4-20mA instrument signal. 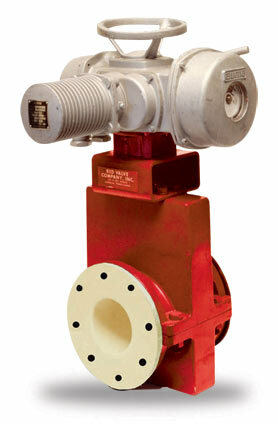 The Series 5800 has the same face-to-face as gate, plug or ball valves, ANSI 16.10 up to 6” sizes. Optional 8”, 10”, and 12” are available with cone sleeve trims.